What to think of the Beatport Top 20? 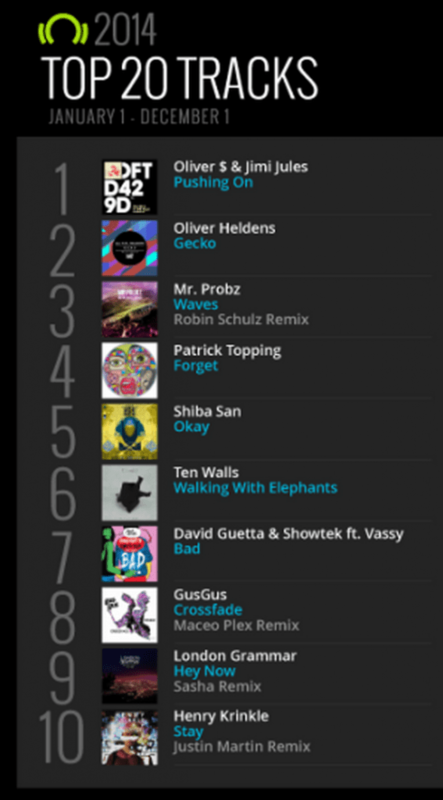 As we look at 2014’s Beatport Top 20, it’s clear that a lot has changed over the past five years. The best selling tracks on Beatport are not ruled by EDM anymore. Not that the term ‘Deep House’ is being used quite like it should be, but the change surely means something positive. It’s a start when people are getting more interested in different kinds of music than the EDM sound, which is being debated, ridiculed and even demonized all too often. I, myself also started out with more commercial music than what I listen to now, simply because that is what you get smashed into your head through the radio and other mainstream music sources. After a while you start to dig for your own specific sound and gradually find out there is so much more to find out there; you’ve barely even scratched the surface. That is where heads get turned and personal taste is being formed. The change in the structure of the Beatport top 20 reflects this phenomenon in a larger crowd. People are getting more interested and actually start to discover on their own instead of depending only on media to tell them what to listen to. Media is now playing a more suggestive role, where people tend to make their own decisions earlier than before. Last year saw no huge megahits on Beatport like the year before, maybe because people are looking for more novel music than the simple radio hits. Just look at the rise of Ten Walls to the top 10. So here’s a suggestion to the people crying about Robin Schulz‘ remix not being deep house, or Oliver Helden’s not being deep house. As true as it may be, it’s perhaps best not to worry about it all too much, as institutions like Beatport (and journalists too, by the way) need to have certain frames in which they can file new music and sounds under. Without this, the music market would be disordered and hectic. We strongly believe, however, that in a little while a large share of those that are now getting sucked into the readily available bombastic soundscapes heard on the radio will eventually start digging deeper and connect with a sound that is much more their own. Until then, we say live and let live, and respect that others haven’t found their way around underground dance music the way that some of the purists have. What is most important is that, when you’re into dance music for the right reasons, everybody will find that way eventually.